We probably have more rare earth deposits in Canada, or controlled by Canadian-listed juniors, than anywhere in the world. 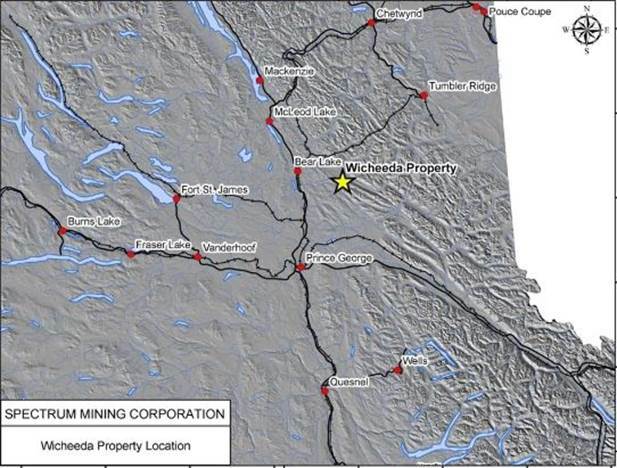 But Spectrum Mining Corporation, a private company, controlled one of the best – the Wicheeda Lake REE claims 80km north of Prince George, BC. In 2008 Spectrum contracted Falcon Drilling Ltd. of Prince George, B.C. 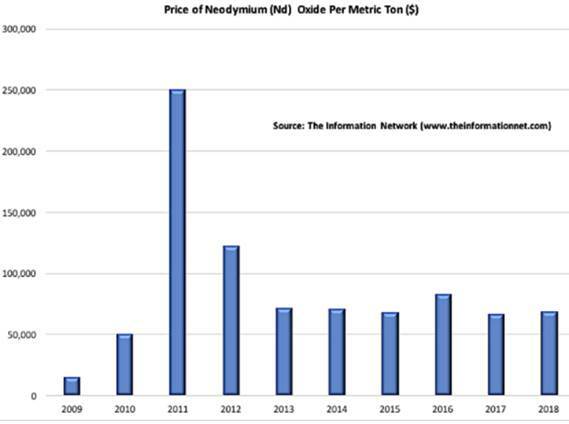 to drill 4 BTW size diamond drill holes, totaling 866 meters, at varying azimuths and dips from 1 drilling platform into their Wicheeda Lake "Main Zone" cerium soil anomaly. All 4 drill holes intersected potentially economic Ce, Nd, Sm, Nb and La rare earth mineralization over drill core lengths varying from 66m to 231m starting at their collars. In 2009, eleven NTW diamond drill holes totaling 1835m were drilled into the "Main Zone” from 2 new drilling platforms. Drill site 2009-A was located approximately 100m northeast of the 2008 drill site and seven 150m long drill holes were completed from it at various azimuths and dips. All seven holes intersected significant intervals of rare earth mineralization varying from 56m to 148m long starting at their collars. Drill site 2009-B is located approximately 100m north of drill site 2009-A and approximately 150m northeast of the 2008 drill site. Four drill holes were completed from it at various azimuths and dips. Again all four holes intersected significant intervals of rare earth mineralization varying from 95m to 147m long starting at their collars. The Wicheeda Lake deposit is open in all directions. First Legacy Mining Corp., now Defense Metals Corp (TSX.V:DEFN) after a name change, entered into an option agreement with Spectrum Mining Corp., for its Wicheeda Lake claims, in November 2018. DEFN resumes trading on January 2nd, 2019. Wicheeda Lake is a very attractive light rare earth deposit. It has very simple mineralogy and there very easy extraction/metallurgy. This deposit is less than a two-hour drive down major roads from Prince George, BC, a major logistics center. Roads run right to the deposit. It has power, water and a rail yard very close by. It also has access to workers who are experienced miners and others experienced in chemical handling. Your author believes this is the perfect rare earth deposit. It has exceptional mineralogy, easy metallurgy and location, location, location. And it has all the infrastructure necessary for a very low capex (capital expenditure) to be put into production. And the timing couldn’t be better, the US and Europe are both overwhelmingly dependent on their REE supply from China. China dominates 80 percent of rare earth mining and nearly 95 percent of rare earth refining – a position that could easily be abused. After a phone call with DEFN I have no doubt they will prioritize/fast track the Wicheeda Lake REE deposit towards production. 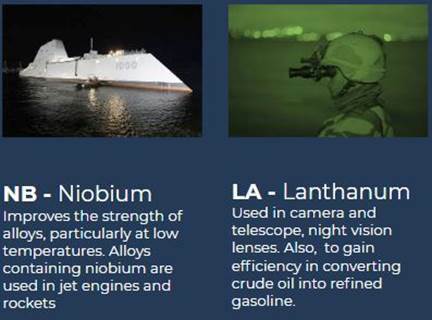 Good news indeed for ahead of the herd investors who understand the highly critical nature of rare earth elements to our economy, and our military. Many REE applications are highly specific and substitutes are inferior or unknown. For all these reasons Defense Metals Corp (TSX.V:DEFN), and its Wicheeda Lake REE project, are on my radar screen. This document is not and should not be construed as an offer to sell or the solicitation of an offer to purchase or subscribe for any investment. Richard Mills has based this document on information obtained from sources he believes to be reliable but which has not been independently verified. Richard Mills makes no guarantee, representation or warranty and accepts no responsibility or liability as to its accuracy or completeness. Expressions of opinion are those of Richard Mills only and are subject to change without notice. Richard Mills assumes no warranty, liability or guarantee for the current relevance, correctness or completeness of any information provided within this Report and will not be held liable for the consequence of reliance upon any opinion or statement contained herein or any omission. Furthermore, I, Richard Mills, assume no liability for any direct or indirect loss or damage or, in particular, for lost profit, which you may incur as a result of the use and existence of the information provided within this Report.